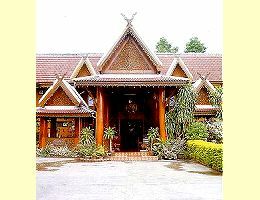 Pictures and location of Baan Tai Hotel in Chiangmai Thailand. Detail description of the hotel, facilities, maps and location. => Read reviews about Baan Tai Hotel. 39 guest rooms, all with private bath and air conditioning, refrigerator, and TV. Well equipped, clean, air-conditioned room with all facilities. Relax in a peaceful and comfortable room looking out to the garden. Relax at the resting corner after a day tour or before going back to your room. At Ruan Dok Kaew, a two-story, exquisitely distinguished restaurant, enjoy your specially prepared continental or local food. At any time, enjoy tasty traditional and international dishes in a warm and friendly atmosphere. Drive time from Chiang Mai International Airport is approximately 10 minutes.